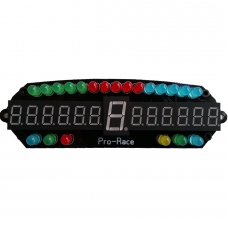 This an update of the popular but not available anymore Pro-Race display. 20 inputs on the back of the display. Each input can accept a push button, a toggle switch or a rotary switch. 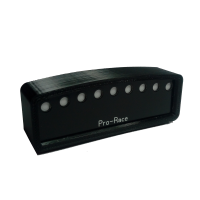 Each input has its own dedicated pair of pins, making connection much easier compare to the previous version of the Pro-Race. The Pro-Race is detected by Windows as a Game Controller. 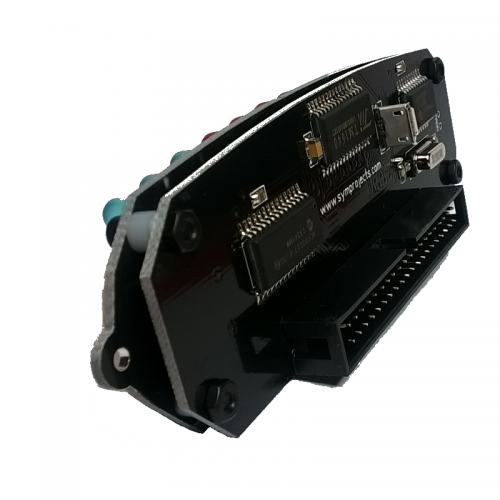 This means the connected push buttons, toggle switches and rotary encoders can be used to control the simulator, like with any other game controller. In this section of the configuration screen, the brightness of the displays and LEDs can be adjusted. The Data configuration screen is used to configure what data is associated to each of the 6-digits displays. Lists 1 and 2 in the picture above select what data is shown on each display. More data can be associated to each display and the settings marked with 3 and 4 define which buttons, switches or rotary encoders change the data that is displayed. Note that to change the displayed data, you can use buttons, switches and rotary encoders connected directly to the Pro-Race display, but also those connected to any JC32 or JC24 joystick controller. Each button used to change what data is displayed on the Pro-Race is identified by two value: the Product ID and the button number. The Product ID of the Pro-Race is shown on the top left corner of the configuration screen. If you click the “Learn” button (picture above) the Product ID and the Button number will be configured just pressing the desired button. If the checkbox marked with 5 is enabled, when the displayed data is changed a small description message will be shown for few seconds. This section is used to configure the shift lights, the 15 LEDs at the top of the display. 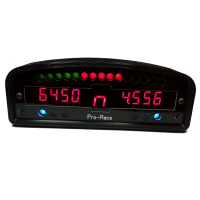 Each LED can be configured to turn ON and optionally to blink at 3 different speeds, based on the value of RPM. To configure a LED, click it with the mouse and the screen above will appear. Here it will be possible to specify at which value of RPM the LED will turn ON and start blinking slowly, at normal speed or fast. If the checkbox marked with 1 (two pictures above) is enabled, the shift lights will display and alternate pattern when the speed limiter is switched ON (it only works with simulators that report the state of speed limiter). Button marked with 2 (three pictures above) opens the Quick Config wizard (picture above), that allows you to quickly configure all the shift lights in one go All you have to do is to set the value of RPM at which the first and last shift lights will turn ON and the software will calculate the appropriate values for the intermediate LEDs. When the checkbox marked with 3 (Read state of shift lights from simulator) is ON, there is no need to configure the shift lights because their state is read from the simulator. So the Pro-Race shift lights and the simulator's shift lights will always behave in the same way. When this checkbox is ON, configuration settings for individual shift lights will be ignored. This feature is only available with IRacing at the moment. The other LEDs can be configured in the screen above. Like the shift lights, each LED can be configured clicking on it and the corresponding configuration screen will open. The configuration screen is very similar to the one for shift lights. The only difference is that more data can be associated to these LEDs, not only RPM, but also fuel level, water temperature, flags and so on. The last section is dedicated to the configuration of rotary encoders and toggle switches. Rotary Encoders are special devices with 3 pins. Each rotary encoder replaces 2 buttons: when the encoder is rotated clockwise a press of one of the buttons is simulated. when the rotary encoder is rotated anti-clockwise, a press of the other button is simulated. Toggle Switches are two positions switches (ON and OFF). When an input is configured to work with toggle switches, a button press is simulated when the toggle switch is moved to the ON position and another button press is simulated when the toggle switch is moved to the OFF position. The Polling Interval setting determines how often the inputs of the controllers are read. The default value is 20ms, which is usually fine if you are only using push buttons. The reason why you don’t want to read the state of the buttons too quickly is because when a button is pushed , its contacts normally bounce for some milliseconds and, if these bounces were read by the microcontroller, multiple button presses would be reported. Instead, reading the state of the buttons every 20ms normally guarantees that the bouncing stopped, between readings. If you are using rotary encoders, 20ms between one reading and the following could be too long if you rotate the encoder very quickly. In that case the polling interval can be reduced to 15ms, 10ms or 5ms. 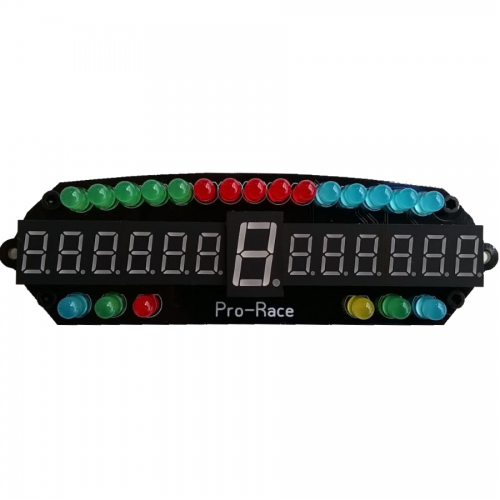 On the back of the Pro-Race controller there are 40 pins that are used to connect push buttons, rotary encoders and toggle switches to the display. 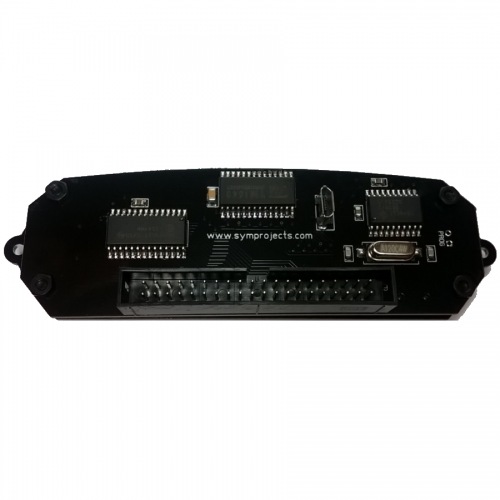 Connections are easier compared to the previous version of the display, because connections pins are not shared any more and each button, switch and rotary encoder have a dedicated set of pins. Buttons and toggle switches are connected with a pair of wires to pins 1 and 2, 3 and 4, 5 and 6, up to 39 and 40. Rotary encoders have 3 pins. The pins at the sides are connected to the top row of pins on the back of the Pro-Race display. They must be connected to pins 1 & 3, 5 & 7, 9 & 11…. up to 37 & 39. The middle pin of the rotary encoder connects to one of the pins of the bottom row. Choose one of the pins right below the ones connected to the other two pins of the rotary encoders. In the picture above, the middle pin of the rotary encoder on the left is connected to pin 2 of the Pro-Race. Pin 4 could have been used also. Download this file to measure the size of the display and position of the mounting holes. You can print it or measure everything on the screen. To open it, install Sprint-Layout Viewer. The Pro-Race display is also available with an enclosure. If the Pro-Race is mounted on a wheel, we suggest to secure the USB cable to the wheel in a way that the cable moves together with the display and it doesn't stress the micro USB connector on the back when the wheel is rotated.